As I mentioned in my previous blog post, Havana was at the center of the pirates’ world. So when I visited the city as part of the Minnesota Orchestra’s recent tour, I desperately wanted to climb around one of these real-life pirate forts, which are open to the public and serve as museums. But as I’ve alluded to, free time was in short supply and there was no way I could visit them all. So many choices… which one to pick? 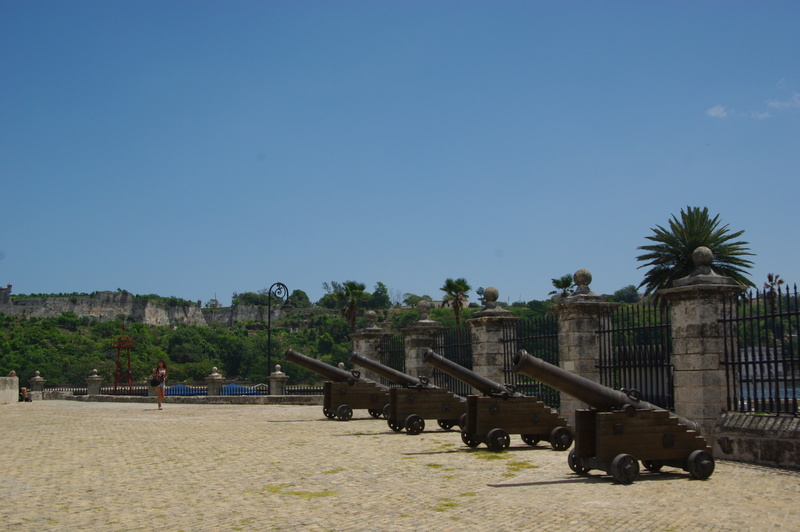 Ultimately, I decided to visit the oldest—the Castillo de la Real Fuerza, in the center of Old Havana. Finished in 1577, it had successfully intimidated Francis Drake, who had otherwise looted and sacked his way across the Caribbean. It was, therefore, a pirate fort with some serious street cred. It was an altogether wonderful experience, which provided a fascinating glimpse into the age of piracy. Plus, my visit also provided a fascinating glimpse into modern Cuban culture, too. 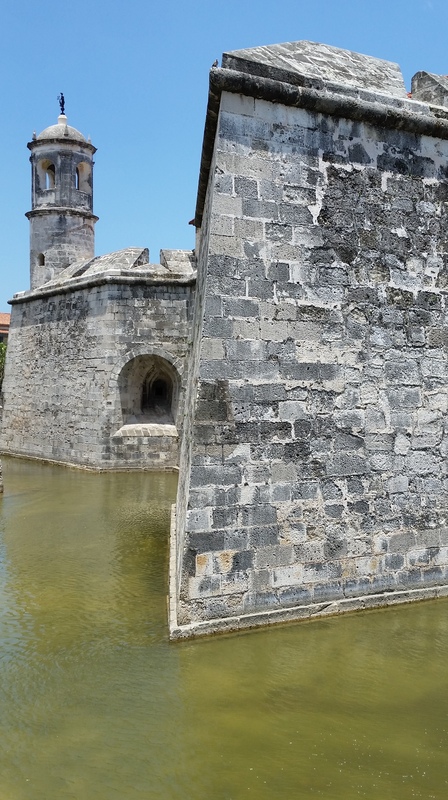 The mighty Castillo de la Real Fuerza, built in 1577. 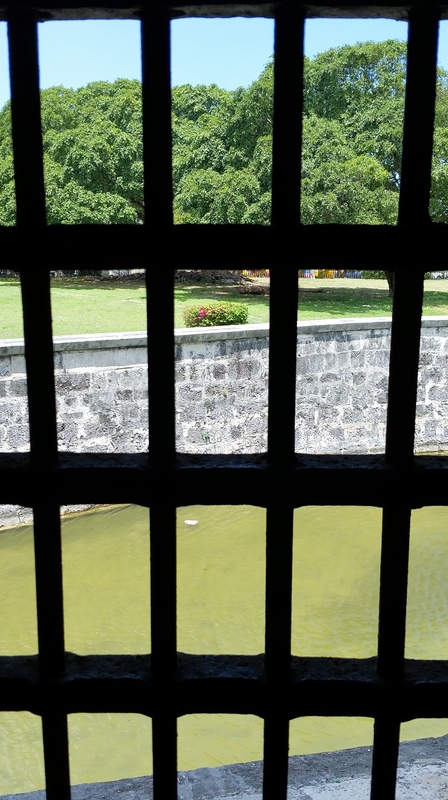 This star-shaped fortress made Sir Francis Drake think twice about attacking Havana. She then moved me from room to room, each one filled with miniature wonders. She pointed out all the various artifacts that archaeologists had found from around the grounds—combs, swords, pipes, pistols, goblets and other objects that the soldiers had used while stationed there. But she really glowed with pride in showing what she called “her treasures”… artifacts recovered from shipwrecks in the waters right outside the harbor. And they were impressive: a cache of Colombian emeralds, handfuls of coins, gold ingots, even bars of silver still bearing the stamp of the Potosí, the famous South American silver mine where they originated. A view from the dungeon. 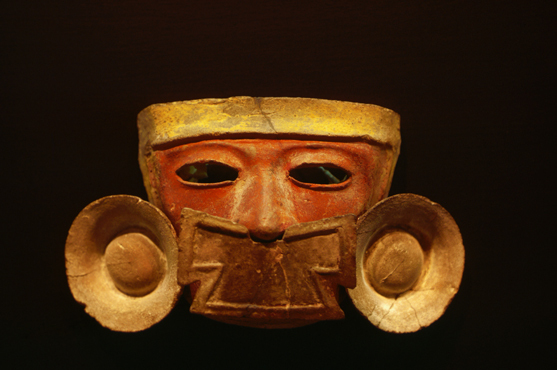 But in every case she told a story about the object, a personal reminiscence or observation. I think she was thrilled to have an appreciative audience. She also shooed me up the stairs of the bell tower, saying that that provided the best views of the Morro fortress and the harbor’s entrance (she was right). 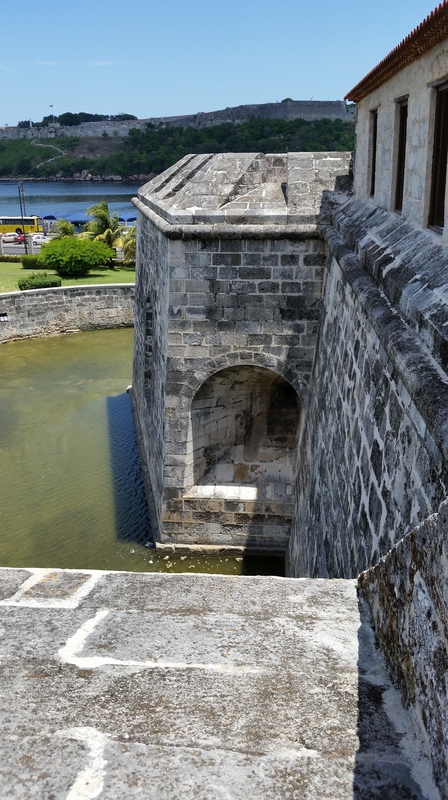 View of the mighty Castillo de los Tres Reyes del Morro fortress guarding the narrow entrance to Havana’s harbor from the bell tower. 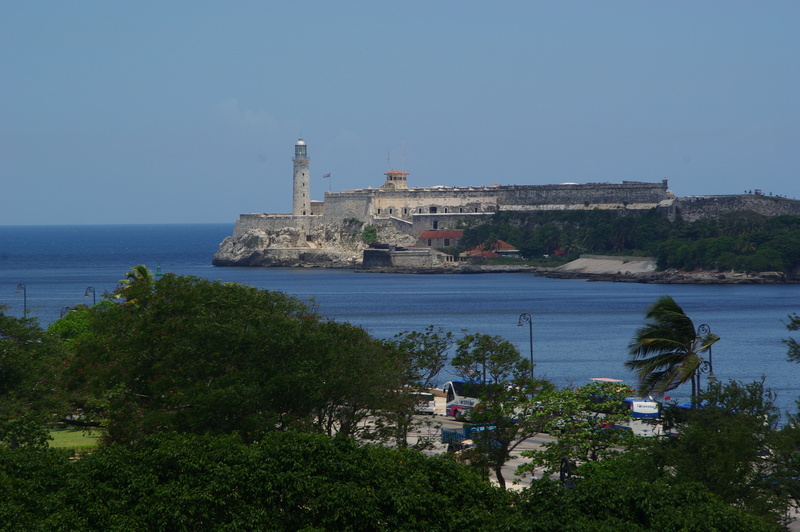 Upon this particular tower is perched one of Havana’s most famous symbols, La Giraldita. This is a jaunty weathervane in the form of a woman slightly lifting her dress to show some leg, which was added to the tower in the 1630s. The legend is that the weathervane represents Doña Inés de Bobadilla, Havana’s only female governor; she assumed control from her husband Hernando de Soto when he undertook an expedition to Florida and is said to wait patiently for his return. Perhaps Doña Inés is showing her leg in an attempt to hurry him along home? The “new” bell tower of 1630, with La Giraldita perched on top. I appreciated the motherly advice that my guide gave me as I ascended the bell tower’s staircase—she warned me to call out before going up, as the spiral staircase was so narrow that two people would not easily be able to pass. Everything was done with a sense of hospitality; this wasn’t a docent giving a tour, but a hostess showing me around her house. I think she was as excited as I was to walk around the rooms. Moreover, there was a deep and wonderful sense of pride to her presentation… this was evident in every word and gesture. At the end of the day, that was one of the biggest takeaways from my visit. It wasn’t just history we were talking about, but her history. And it was a privilege to hear that history as told by such a warm-hearted, enthusiastic storyteller. One of the bastions of the fortress, from the upper ramparts. In looking back over my Cuban trip, that is perhaps one of the things I remember most fondly—the hospitality of the Cuban people. People who were eager to share their country with us, regardless of the fact that our governments are not on the friendliest of terms. It was evident in each interaction, in every place we visited. And it makes me eager to return. 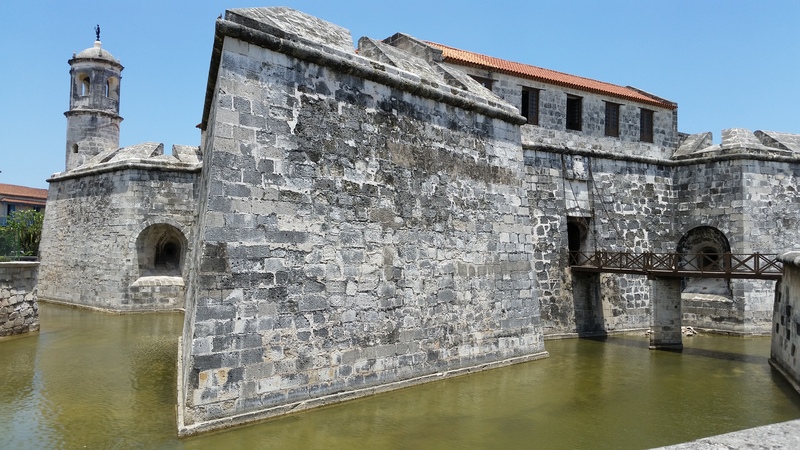 This entry was posted in Cuba Tour 2015, Minnesota Orchestra and tagged Castillo de la Real Fuerza, Havana, Sir Francis Drake by Scott Chamberlain. Bookmark the permalink.